Angry crowds greeted the French far-right leader Jean-Marie Le Pen during a visit to the UK on Sunday. 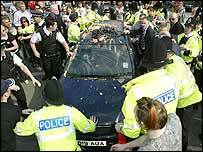 Protesters hurled eggs and rubbish bins at his car as he stopped in Cheshire to endorse the British National Party. More than 100 demonstrators turned out, pounding Mr Le Pen's car and chanting slogans denouncing him as "fascist". But Mr Le Pen, who later attended a fund-raising dinner hosted by the BNP, said: "I don't see why I shouldn't be able to walk about freely in England." The crowd had confronted Mr Le Pen outside a hotel in Altrincham, near Manchester, where he was attending a BNP press conference. Police and private security officers tried to protect him as he attempted to slip by the protesters. Demonstrators chanted "black and white unite and fight", and "the BNP is a Nazi party". One anti-BNP protester, Alec McFadden, described Mr Le Pen as a "well known fascist." "He is someone who has done everything possible in his own country to divide the community," he added. 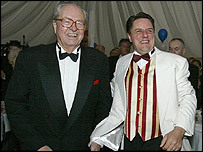 Angry shouts could be heard as Mr Le Pen and BNP leader Nick Griffin held their news conference inside the hotel. 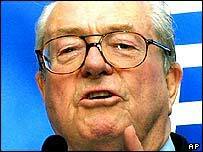 Mr Le Pen expressed amused surprise at the strength of feeling his visit generated. "I've walked about freely in Iraq and Turkey, in Malaysia and Indonesia," he said. He said both the BNP and his National Front party recognised what he said was a threat to Europe from immigration originating in the developing world. "If this phenomenon is not stopped, our populations will be subjugated," he said. Later tight security stopped protesters gathering within miles of a dinner for Mr Le Pen hosted by the BNP in rural Wales. About 150 people stood and cheered as he entered the formal black-tie event as their guest of honour. Dozens of police guarded the country lanes for miles around ensuring that a repeat of earlier angry protests was prevented. Red, white and blue banners and balloons filled the tent in a field near Welshpool and the crowd went silent as Mr Le Pen arrived and took his seat. Earlier home secretary David Blunkett said Mr Le Pen was an EU citizen and had the right to travel. On Sunday Mr Blunkett told the BBC: "I'd rather Mr Le Pen wasn't here. I'd rather the British National Party didn't exist in our country." But he said Mr Le Pen was free to come and go as long as he "behaves himself". BNP leader Mr Griffin told reporters it made sense for nationalists to work together. He said: "Unless the nationalists of Europe cooperate, the internationalists of Europe - the Eurocrats - will destroy all our national freedoms and identities separately." Trade unions and anti-fascist groups say Mr Le Pen's presence will inflame racial tensions and "pose a danger to all". Ken Livingstone, London mayor and chair of Unite Against Fascism, said: "We should ... learn the lesson of France, that it is possible for fascists to gain a hearing by seeking to appear as legitimate politicians." "The vast majority of people in Britain abhor fascism and racism and everything Le Pen stands for." "At his news conference (Mr Le Pen) made light of the demonstration taking place outside"